Sri Lanka’s investment climate is deemed to be favourable with the ease of investment improving from 57.5 per cent in 2015 to 58.96 per cent for 2016. This is indicated in the World Bank’s recently released annual ‘Doing Business Report’, which gives significant coverage to the country’s relatively stronger position compared to its South Asian counterparts. With only Bhutan and Nepal ranked better than Sri Lanka, several news sources have heralded the performance of the country relative to the South Asian region. However, while comparisons to the region are important, the growth of mega-regional trade agreements such as the Trans-Pacific Partnership (TPP) requires consideration of countries beyond the immediate regional focus. Due to the availability of tax-free export opportunities to large markets such as the US in garments and other related sectors, investment is likely to divert away from Sri Lanka towards TPP members (e.g. Vietnam). Therefore, this article briefly analyses disaggregated data of selected indicators for Sri Lanka to obtain a view beyond South Asia. 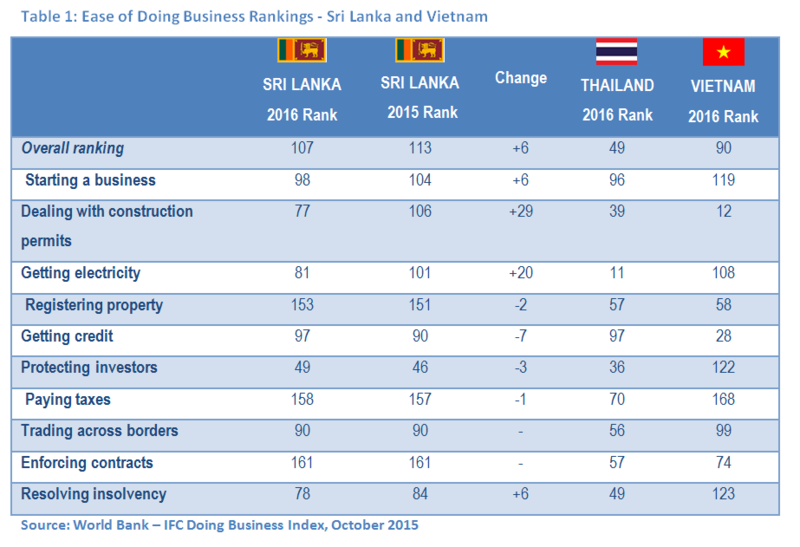 Notably, Sri Lanka has made most progress in areas related to physical infrastructure (“Dealing with construction permits” and “Getting Electricity”). This could possibly be attributed to knock-on effects from the emphasis on infrastructure investments over the past decade. 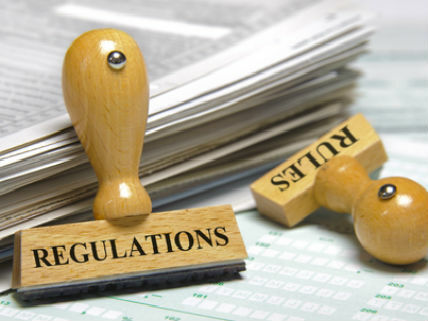 As important policy reforms, the World Bank also specifically notes streamlining the internal review process for building permit applications and eliminating a requirement to notify the Registrar of Companies about the stamp duty payment for the initial issuance of shares. However, Sri Lanka appears to perform worst in areas that require institutional coordination. These inefficiencies in turn appear to create bottlenecks in the creation of new businesses while restricting their growth. For example, Sri Lanka is ranked at 153 in registering property. Even though the country is ranked better than most other South Asian countries, indicators demonstrate stagnation while other regional partners show steady improvements. 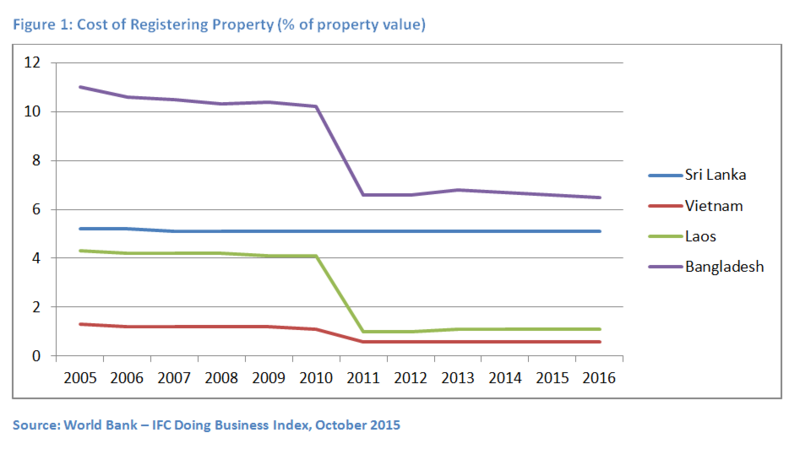 For example, Sri Lanka’s cost of registering property (as a percentage of property value) remains stagnant while Bangladesh, Laos, and Vietnam have significantly reduced their costs (Figure 1). Sri Lanka takes approximately three times longer (1318 days) than countries such as Vietnam, Cambodia, and Laos, to enforce a contract. Similar trends can be identified throughout the Report where rankings fail to illustrate the country’s poor performance in light of rapid improvements elsewhere. Therefore, in order to mitigate the potential of being “left behind” in domestic and foreign investments by competitors, it is imperative that institutional reforms are immediately initiated in the country. The negative effects of bureaucratic bottlenecks are exacerbated by constraints in gaining access to finance. The lack of options for SMEs to finance business ventures deters entrepreneurship and also hampers SMEs from expanding. Beyond the rankings drop (caused mainly due to methodological changes in measurement), a comparison of the indicators demonstrates the institutional weaknesses that pervade access to credit as well. Weak legal rights mainly influence the country’s poor performance in this sector. The strength of collateral and bankruptcy laws to protect the rights of borrowers and lenders is considerably lower than other developing countries. As shown below (Table 2), Sri Lanka has secured a meagre three out of twelve important policy prescriptions based on the strength of legal rights that facilitates lending. In contrast, Vietnam and Cambodia have scores of seven and eleven, respectively. The Report suggests that ideally, a country should implement at least six of the prescribed policies to enable business creation and growth. Similar to previously noted indices, Sri Lanka’s performance remains stagnant while other developing countries have gradually improved their regulatory mechanisms. The Report measures three sets of procedures associated with time and costs (excluding tariffs) within the process of exporting and importing a shipment of goods – documentary compliance, border compliance, and domestic transport. As a relatively small economy, it is vital that local businesses have access to international markets. The recently introduced “ Economic Reforms” for Sri Lanka highlights the need to integrate the country’s businesses into global value chains. However, the Report sheds light to some of the key institutional and structural factors thwarting successful participation in global value chains. Successful participation in global value chains depends heavily on expediting the trading processes (e.g., customs clearance times), and addressing non-tariff barriers, which act as a hindrance to movement of goods. The Report notes reasonable gains over the years to reduce clearance times and document compliance costs. However, continuous advances are necessary to fully accommodate SMEs around the country to participate in international trade. For instance, the Report notes that 72 hours and 58 hours are needed for border compliance and documentary compliance in imports, respectively. In contrast, countries which have successfully integrated into global value chains such as Singapore require 35 hours for border compliance and just one hour for documentary compliance when importing. To make the best use of value chains and become a preferred source of value addition, the process of importing, adding value, and exporting should be carried out in a prompt manner. It should be noted that the Report highlights only one among a plethora of factors that facilitates the successful integration of developing economies into global value chains. Yet, it acts as an important indicator of the challenges the economy faces. Interestingly, amidst heavy investments in developing the road networks of the country, the domestic transport speed and cost per distance (USD/km) remain high. Whereas Sri Lanka’s cost per distance is 22 USD/km, Vietnam’s (3.4) and even Bangladesh’s (0.9) cost per distance remains significantly lower. The high cost per distance in the country compared to its regional partners has several implications to the nation’s development agenda. Investments will concentrate around Colombo due to high transportation costs. Consequently, the economy is likely to experience significant disparities in investment and economic growth across regions. Given that an “inclusive growth” agenda is in the national interest, the government should be cognisant of improving connectivity across the nation and improve efficiencies related to transportation. This means that infrastructure and other related investments should be based on economic interests, rather than political interests, to create benefits to those beyond a few selected regions in the country. In doing so, the private sector could also contribute better towards inclusive growth by engaging SMEs via mechanisms such as subcontracting, and promoting ‘clustered’ production together with buy-back schemes. Approximately 80 per cent of businesses in Sri Lanka are SMEs and contributes over 50 per cent of the nation’s Gross Domestic Product (GDP). Therefore, the Report is particularly relevant to the country’s growth prospects. While it is vital to establish an enabling environment, Sri Lanka’s performance in the ‘Doing Business Report’ is a reflection of significant structural limitations and the consequent dearth of entrepreneurship. Sri Lanka has remained stagnant in many aspects, whilst its competitors have made significant gains towards improving the efficiency of doing business. Policy makers should be mindful that regulatory frameworks to influence the ease of doing business addresses only a limited scope of factors that relate to the growth of foreign and domestic investment. Thus, economic reforms are urgently necessary to improve the efficiency of institutional cooperation and policymaking along with other policies to spur economic growth.